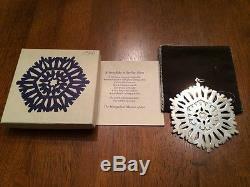 1972 Snowflake Sterling Ornament by Metropolitan Museum of Art. 1972 Metropolitan Museum of Art solid sterling silver Xmas snow flake ornament, 2nd in the eagerly sought series of annual snowflake ornaments, measures 3 1/8 inches wide, and is properly hallmarked on the reverse. It is in very nice condition with only minor scratches consistent with age and use. These ornaments are SOLID, heavy sterling silver unlike some of the other popular ornaments that are hollow. This one comes with the original box, pouch and romance card. As with all vintage silver, may require proper polishing upon receipt depending on your preferences. A Snowflake in Sterling Silver -For a Christmas Tree -or a Christmas Wreath -or to mix with holly -or to hang with mistletoe -or to float in solitary splendor. The second in an annual series. The Metropolitan Museum of Art. Be sure to check my other listings for more MMA, Towle, and Gorham sterling pendant / medallion / ornament / charms. 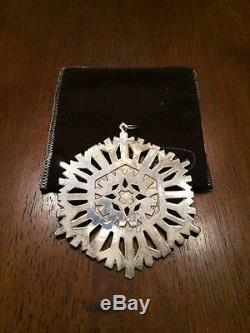 The item "MMA 1972 Snowflake Sterling Silver Christmas Ornament Metropolitan Museum Art" is in sale since Tuesday, July 04, 2017. This item is in the category "Home & Garden\Holiday & Seasonal Décor\Christmas & Winter\Ornaments". The seller is "presentofthepast" and is located in Chambersburg, Pennsylvania.